We now sit just over 48 hours away from the big grain stocks/acreage report released by the USDA on Friday. The market has perked up a little in the overnight at the CBOT as the short covering appears to be the cause. The volume of trade has improved overnight with CBOT corn, soy and wheat futures slightly higher. The confluence of the report and the end of the quarter are probably going to make for a two sided trade into the number. I imagine we see some selling ahead of Friday in corn and beans given the expectations for higher acres in both, relative to ag forum. Wheat got a few pieces of bullish news in the overnight, Egypt has refuted the report there would be a ban on private imports this year from earlier in the week. The market was concerned about less export competition from the bigger players, that appears to have subsided for now/. Also, India who announced earlier they would impose a duty on imports (as normal) have come out and stated they would look to import 3 MMT of wheat in the future. This is good news for the market, the India story is one the bulls pin hopes on for a global demand rebound. India had a tough growing season across all crops, cotton as well. I hear they will be heavily interested in a lot of markets from Australia. Good thing the Aussie crop did so well. KCW regions will remain in the cross-hairs of the low pressure system out west. 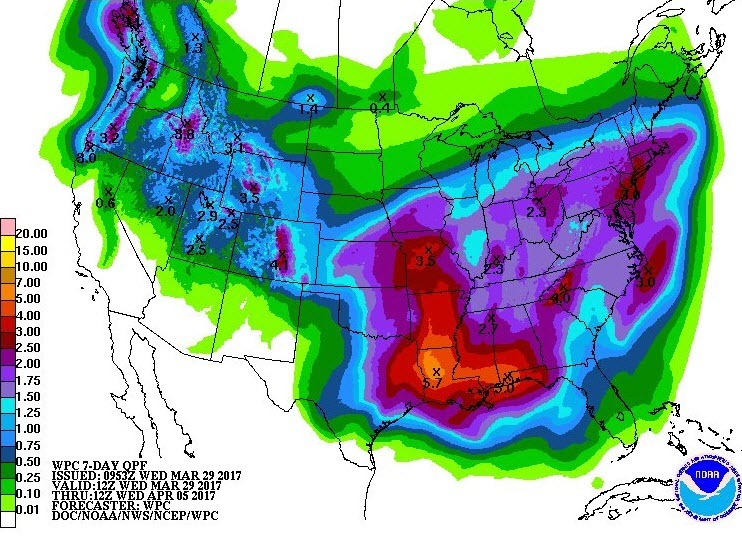 At least 2 more storm systems are offered over the next 10 days which will further help to aid HRW wheat. Too much rain could be an issue but its too early to worry about planting delays. Soybeans have a moisture story as well, but it is south of the equator. The rain hitting Argentina over coming days will cause some flooding but only a small fraction of Argentina’s soy and corn crops will be affected. Brazilian port soybean offers have fallen since the start of the month and are now offered below the US for June and July, while remaining above for the months prior. The potential ship lineup for April remains very light, with just 3.5 MMTs scheduled vs 8 MMT in March. It’s been an uneventful week in the CBOT soy complex, and choppy markets are expected to continue into midday Friday. My concern for soybeans is the meal. COT reports showed a substantial amount of soy meal longs in the trade still, bearish news could spill hard into that market. For those betting on a meal led rally, I would be concerned the crowded trade that remains. Bean oil is where the story is in my opinion, not meal, given the really tight stocks to use globally and in the US. Corn markets will be watching the USDA for any sharp increases in acreage before making another leg lower (a leg I would be buying). The weather will also be in the forefront as well, given the amount of rain expected in the southland over the coming week. Planting delays for the main belt are not a worry (yet) but they are becoming a concern in the south (check out the 7 day outlook). Guys as far north as Tennessee are telling me they wont likely be moving until mid April at the earliest. This is not anything I would be concerned about when looking at the production bottom line yet, but if the USDA would disappoint the bears and come out with numbers below 90 million, this will be an issue. Any number below 90 million should bring production down regardless of a trend yield, so the pressure will be on. Good news was also heard from the DDG side out of China last night about an increase in DDG buying. This is music to the ethanol industry’s ears. There is a bunch of cheap feed out there in the form of DDG’s, its fantastic to see low prices curing low prices. Cotton, like the corn and bean markets will be very watchful of the USDA numbers on Friday. Banks are starting to jump on the short side estimates given the amount of acres to be expected and the fall in the price of polyester.Crude oil apparently is having a negative effect on cotton through the price of substitutes. There is so much negative news facing cotton in coming months its hard to see prices staying at these levels. I know I have been a broken record on that, but the fall in price from the rest of the Trump inflation markets (copper, beans, steel) have me very interested in adding to shorts. I think selling December makes the most sense but the July puts are a good cheap way to play a pullback. One thing I do worry about playing July is that this is a new crop story, but I think if one falls they all fall so it should suffice. Bottom line, newsflow will take a back seat to the report on Friday (hog Thursday!). Funds are holding a record short grain position at the start of the Northern Hemisphere growing season and at some point, a weather scare will produce a short covering rally that affords a better sales opportunity. Be ready for that opportunity. i like taking bullish option positions on this break in corn, if the USDA reports would give the opportunity. Soybean meal feels like a better short play than beans at this juncture, given the funds still have a hearty position. Cheap lottery ticket players might look at the May 300 put for less than 150 dollars per.